James T produced challenging courses (as expected!) which were positively received by competitors. Thanks to James, assisted by Midge, for all the controls out / controls in and to to soup kitchen on the night. The event will be based at Carrbridge Village Hall with a walk from there to the terrain of Tolquhonie & Beddengorm Woodland. BASOC wish to acknowledge the cooperation of the Carrbridge Capercaillie Community Working Group and Scottish Woodlands. Park in the main car park in Carrbridge; cross the road safely to the village hall which is slightly up the road from the car park. Registration at Carrbridge village hall. 1.8km walk to the start. Similar distance back from the finish which is only a short distance from the start. It is possible (and advisable) to leave extra clothing at the start. 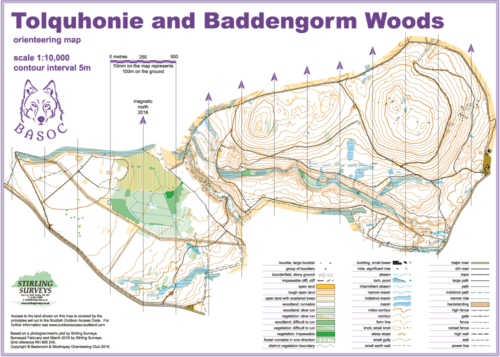 Tolquhonie is a lovely Scots pine woodland with good runnability throughout while providing a physical test at the same time. To provide good courses and visit some new bits of the area from 2 years ago there are not very obvious early cut back options and less similarity between the start of the long and medium than other rounds. The long is a great test and enjoyable and I walked round it (and I do mean walked!) in 70mins. That was in the dark with no flags out (though I didn't make many mistakes! ;-) If you are worried about coping with the long then it may be advisable to do the medium. All competitors should collect their map from Registration BEFORE going to the Start. but there will be limited entry on the night dependant on map availability. Toilets available in the hall.